Lord, today we pray for the children in the Zelican refugee camp outside of Mosul, Iraq. Thank you that so many people have been able to flee Mosul before and during the military operation to retake the city. We are so thankful for everyone involved in providing places of refuge. 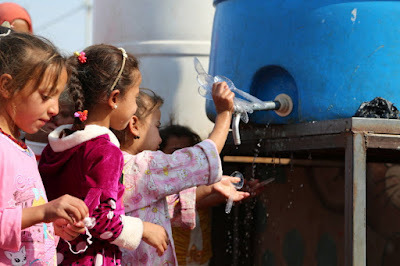 Today we specifically pray for the child-friendly “safe places” aid agencies like World Vision are providing in Iraq. These children have experienced true terrors beyond their years, yet they are still youths. They need to feel safe; they need to play; they need their basic needs met. Please bless World Vision and other organizations meeting these needs. We pray for the adults supervising and ministering to these children, that they would have great endurance, grace, wisdom and inspiration as they seek to meet these deep needs, while helping the children process their experiences and pointing these young ones to the ultimate comfort in you. May people give generously so that these children may have clean water, food, shelter and even fun as they experience their new lives in the Zelican camp. In Jesus’ merciful name we pray, amen.